Borrow an idea from Tesco (every little helps). I’m dipping into my swipe file again today to share a great idea from Tesco. Spotted in the London underground. I think this is an inspired campaign and one we can all learn from. So let’s consider what makes it so good. The image grabs attention which is the first challenge for any marketing communication. What makes this image particularly clever is that it conveys the impression of a Tesco delivery van but using the iconic style of a London underground map. The headline describes the problem and the solution. This is something we should all try to do but it isn’t easy. This advert is aimed at busy commuters so making time for shopping is a problem most will recognise. We drop off is the solution many will be willing to pay for. The destinations on the ‘map’ are a mixture of features and benefits designed to prompt readers to think how they could use the service. So features: vegetarian, nibbles, wine etc. and benefits: dinner made easy, time to unwind, keeping healthy are all intended to stimulate our desire. Follow through on that link and you arrive at a specially constructed landing page on Tesco’s online ordering system. The page uses the structure of a busy commuters day whilst giving access to the rest of the Tesco online ordering system. 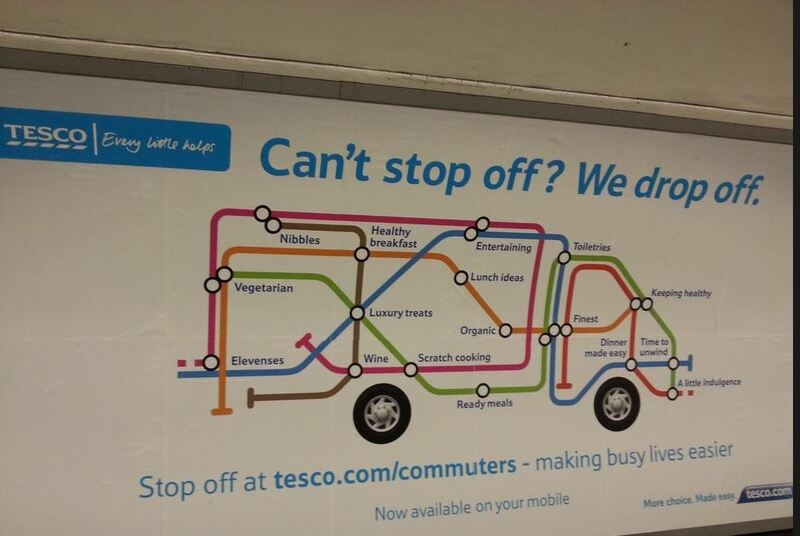 In case we should be in any doubt that this is for us the ad finishes with the strap line ‘making busy lives easier’. This clearly defines the target audience in a benefit laden statement. So there you have it, a very effective advert which demonstrates how to deliver an effective targeted campaign. Tesco is not interested in all the tourists on the tube, they are not going to buy on a regular basis, it therefore doesn’t matter whether or not they understand the advert. This entry was posted in Marketing, Small business advice and tagged advertising, Customer, London, Shopping, Supermarket, Tesco by glendashawley. Bookmark the permalink.